We continue working with the Cooking Pot Analogy, and like all analogies it works to a point, but don’t push it. When we come to Wise View, this is especially true. Yes the pot itself is a means of holding, and we ‘hold views’, so it seems appropriate. But in looking at the Eightfold Path, it’s important to remember that all of the parts are completely interconnected and work to support each other. This is certainly true with Wise View. Without the skillful practices of the others, we could not arrive at a Wise View. So for the purposes of our analogy, imagine this is a cast iron pot that is seasoned by its contents of Wise Mindfulness. Furthermore, remember that the pot, like all matter is not as solid as it seems, simply a pattern of atoms, etc. so don’t get attached! 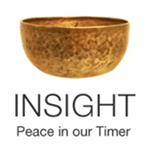 Just as Wise View depends on mindfulness, intention and effort to be wise, we find it much easier to be fully mindful, exert Wise Effort and set Wise Intention when we practice Wise View. But what is this Wise View? We all have our own way of looking at things, so where does anyone come off claiming that one particular view is the wise one? Wise View in this case is not about opinions, but seeks clarity, an undistorted vision of reality ‘as it is.’ It incorporates an understanding of the nature of impermanence, Anicca, (as revealed by nature in the seasons as well as in the mirror — yikes!) and the concept of no separate self, Anatta, (revealed when we do inner exploration as we did with the Five Aggregates); and the understanding of how lack of understanding these two concepts causes suffering, Dukkha. 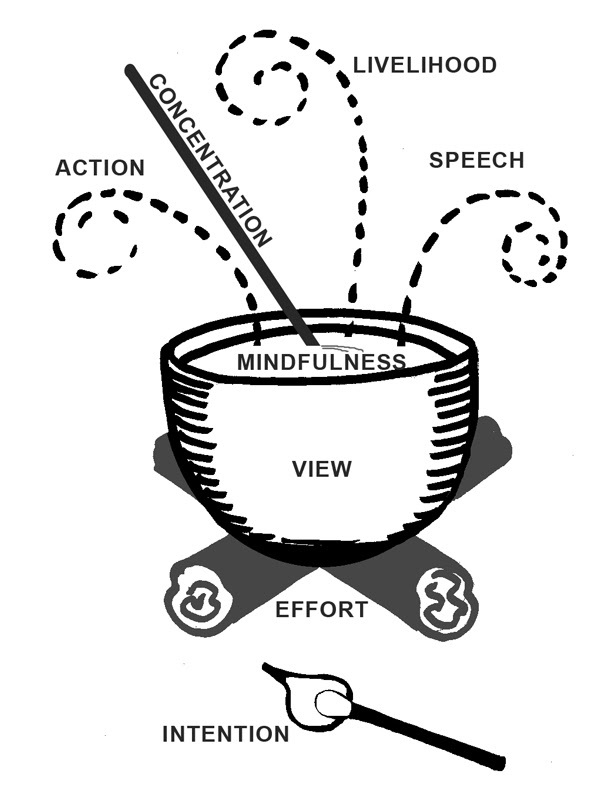 If you have been in class or following along on this blog over the past year of our exploration of the Four Foundations of Mindfulness, this will sound familiar. If not, you might want to read more about Annica, Annata and Dukkha. And if this all seems a little too conceptual and you just want to meditate, don’t worry about it. Coming to this Wise View is not something that can be transmitted just by talking about it. This is where the regular practice of meditation comes in. The more time we spend being fully present in this moment, anchored in physical sensation, the more clarity we get as to the nature of being. The more time we spend experiencing and observing the natural world, free from the frenzy of obligations and distractions, the more we understand the nature of impermanence and no separate self. The dharma reveals itself in this way. Metta universal loving-kindness, is also a direct path to understanding, because when we open to the infinite nature of loving-kindness, we come to see the fallacy of the distinctions we thought kept us apart disappear. We might experience a sense of oneness of being, but this too is not some solid state but a sea of constant change, a whirl of ever-changing systems intrinsically combining and falling apart. When we feel ourselves to be separate, then we are tossed about on that sea. When we open to the true nature of experience, then we are alive in the movement itself. We are the sea. I confess that this is all a lot easier to understand if you ever had the ‘jump-start’ of psychedelics. Many westerners came to the Buddha’s teachings, and other Eastern traditions, through this wondrous glimpse into the wholeness and lightness of being. The problem is that it’s not sustainable. You can’t stay high, and the body-mind cannot take much of that kind of chemical abuse. I never went to India or Southeast Asia like some of my contemporaries, seeking nirvana. I stayed home. But home happened to be the Haight-Ashbury District of San Francisco circa 1966. Turn on. Tune in. Drop out. Each time I would drop LSD back in 1966, mid-high — no matter how wondrous it was — I would turn to my friend and say, ‘Remind me not to do this again.’ I would never recommend mind-altering drugs to anyone, ever. Especially when there is this dependable, healthy means to a sustainable ‘high’ — meditation. That said, when it comes to Wise View, that little glimpse does take the ‘Huh?’ factor out of the mix. If you are in the huh? phase, do not despair. Your body thanks you for your wisdom in choosing the slower more natural course. Find spaciousness in the ‘I don’t know’ mind. That is premium Wise View. Being where we are with what we’re thinking and feeling, noticing it, that is mindfulness at work. Questioning our assumptions, our previously unquestioned beliefs, is equally important. This is an ongoing practice, not just when we are beginning. We ask, ‘Is this true?’ and then ‘How do I know this is true?’ about all the thoughts that come up. This is not self-doubt where we second-guess everything and get entirely stuck, but instead a state of inquiry that allows us to delight in the mysteries of the human mind. When we looked at the Five Aggregates, those aspects of experience that we tenaciously believe ourselves to be, we practiced this kind of questioning. Through that inquiry we came to understand the concept of no separate self. Maybe it didn’t sink in, maybe it never will, but at least the seed has been planted, the question is there. And as Ranier Maria Rilke is so famously quoted in his letter to a young poet, “…try to love the questions themselves like locked rooms and like books that are written in a very foreign tongue. Do not now seek the answers, which cannot be given you because you would not be able to live them. And the point is,to live everything. Live the questions now. Perhaps you win then gradually, without noticing it, live along some distant day into the answer.” Read Rilke’s whole letter. With regular mindfulness practice, especially spending time in complete silence on longer retreats, we can see our view opening and expanding. We might begin to see cracks in the limited view that we’ve held most of our lives, the one we bought into because it is convenient for managing the details of life to see ourselves as separate. When we come upon these cracks, we bring kindness to our exploration and the understanding that our misunderstanding does not reflect poorly on some separate being that is ‘me’, that must be shored up and protected at all costs. Instead we delight — yes delight — in discovery, in opening to the world with an “I don’t know’ mind, with the understanding that everything is not as it seems on the surface. That there is no way to EVER know everything, and it is not required or even desirable to carry the burden of answers. What happens when we find ourselves able to access this Wise View? The world doesn’t become a blur of whirled cellular activity we get lost in. Not at all. We still operate much as we did, but the underlying shift is there for us to deepen our awe and lighten our suffering. How is this idea of impermanence the least bit comforting? How can you relax into it? It has to work in tandem with no separate self, the understanding of all life as complex dance of process, not a collection of isolated objects traveling through empty space. It’s like struggling to swim, giving up, lying on your back and realizing that the ocean supports you. We can float in this awareness of process and intrinsic beingness. I leave you with one last analogy, a traditional one: Coming to Wise View is like a hen sitting on an egg. All the hen has to do is sit there. There is nothing she can do to hurry the process. The egg is taking care of all the internal growth that is needed, thanks to her being there, sitting. So just sit! That’s the practice. This entry was posted in http://schemas.google.com/blogger/2008/kind#post, Rilke, Wise View on September 8, 2013 by Stephanie Noble. i love the hen analogy–sweet image!